Proficiency scales articulate learning progressions and can inform how teachers plan lessons and assessments. Teachers can consider three types of lessons when using a proficiency scale to plan instruction: (1) direct instruction lessons, (2) practicing and deepening lessons, and (3) knowledge application lessons. By examining the levels of a proficiency scale, teachers can determine the kinds of assessments and assessment items that are best suited to 2.0, 3.0, and 4.0 content. A proficiency scale, in simplest terms, represents a progression of learning goals with three levels of difficulty: (1) the target (level 3.0) content; (2) the simpler (level 2.0) content; and (3) the more complex (level 4.0) content. 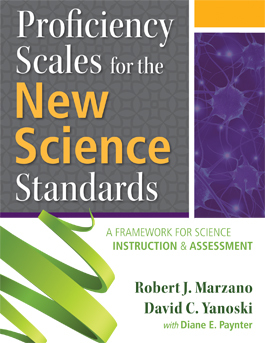 Proficiency Scales for the New Science Standards provides over one hundred proficiency scales, all of which are organized into individual measurement topics as well as broad categories related to various scientific content areas. Teachers can use the scales provided to plan what students will need to know and be tested on throughout the year. The organization of scales, in addition to representing learning progressions, can also inform how teachers structure classroom lessons and design assessments for each unit or topic addressed (pp. 15–17). As teachers use proficiency scales to determine daily class goals, they can mirror a scale’s levels of difficulty by employing different kinds of lessons for different types of content. For example, level 2.0 content (vocabulary terms, introductory concepts, and foundational skills) often requires direct instruction. As the name suggests, during direct instruction lessons teachers explicitly present factual information related to a topic. The second category of lessons (practicing and deepening lessons) asks students to perform exercises that enhance how well they understand a topic or process. This type of lesson may ask students to examine the similarities and differences between objects or categories, practice a skill or procedure, or examine the errors in their own or others’ logic and can help students master the target learning goal, or the 3.0 level of the proficiency scale. The last category of lessons (knowledge application lessons) requires that students apply their knowledge to real-world situations and asks them to generate and test hypotheses. This type of lesson is usually best suited to the more complex learning goal, or the 4.0 level of the proficiency scale. Each type of lesson can be utilized to help students master different levels of the proficiency scale and nuance their understanding of the central concepts in a unit (pp. 33–35). Proficiency scales can enhance how teachers plan and articulate essential content for assessments. For example, in order to design assessments using a proficiency scale, the teacher can first determine which content will be tested and how many items will assess each level of difficulty on the proficiency scale. Typically, at least three to five items per level are needed; however, 4.0 content may only require one or two items because of its complexity. Once teachers have determined the number of items they will use and the content to be tested, they can write or create assessment items that best fit the types of content being tested. For instance, selected-response items are often well-suited to 2.0 content, while constructed-response items may be more appropriate for 3.0 and 4.0 content. In addition to constructed-response items, teachers can also design performance, investigation, or invention tasks to assess student mastery of the 3.0 and 4.0 levels of the proficiency scale. By taking into account the levels of the proficiency scale, teachers can create assessments that more accurately gauge student understanding of the content and skills related to each learning goal (pp. 49–50).